Avid cyclist and New Bern resident Joe Baes rides about 100 miles a week, sometimes 2 or 300. Baes says he’s only had a few interactions like this. A far more common issue bicyclist encounter are distracted drivers. Distracted drivers are a danger to all. 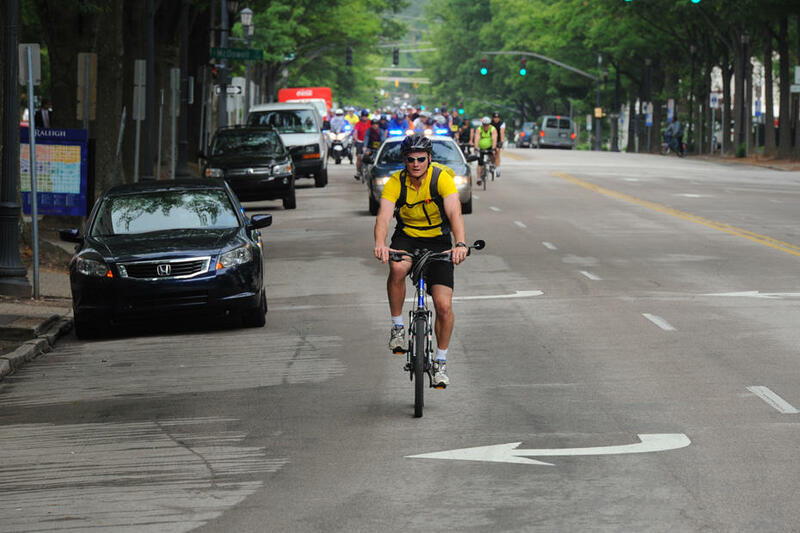 Last year, there were a total of 621 crashes involving bicyclists and motorists. 18 of those were fatal. Many accidents occur when a car is turning at a driveway or intersection. They also happen when a driver makes a lane change without signaling. Baes had close calls himself and knows others seriously injured. Incidents like that are trending downward according to Ed Johnson, the acting director of the State Transportation Department’s Division of Bicycle and Pedestrian Transportation. Numbers could decrease even more, thanks to recent changes in a traffic law that aims to make the roads more bike friendly. House Bill 959 became State Law 2016-90 in July. The measure took effect October 1st. When riding at night, bike commuters must have a lighted lamp on the front and a red light on the rear of the bike that must be visible up to 300 feet, or the operator must wear a reflective vest. Johnson says the requirement is a result of a statewide safety campaign “Watch For Me NC” that promotes bicycle and pedestrian safety. He says law enforcement will be issuing “false tickets” for bicyclist without proper gear. The change will mostly affect casual riders, since cyclists like Baes already wear bright colored clothing when riding in the afternoon and night and have reflective gear and LED lights on their bikes. Baes is all for increasing visibility at night. As a motorist, he’s had a couple of white knuckle moments. According to statistics from NCDOT, most bicycle related accidents occur in the afternoon and evening, when motorists are commuting home from work. Johnson says a change to the law that took affect October 1st allows motorists to safely pass someone on a bike. Drivers are still prohibited from passing in a portion of highway marked with signs or markers indicating that passing should not be attempted. If a bicyclist changes lanes or goes off the side of the road to avoid an accident, the motorist could be fined no less than $200. If there’s a crash resulting in property damage or injury, there’s a penalty of $500 or more. Another section of the new law deals with increasing communication between drivers and bicyclists. In addition to turning signals, drivers must now use hand signals when turning or stopping. The measure requiring hand signaling and allowing drivers to cross the center line took affect October 1st. The rule requiring a bicyclist to wear a reflective vest or attach lights and reflectors to their bike will become effective December 1st. The law change come on the heels of Gov. Pat McCrory’s new initiative Vision Zero which sets the goal to eliminate roadway fatalities in North Carolina.